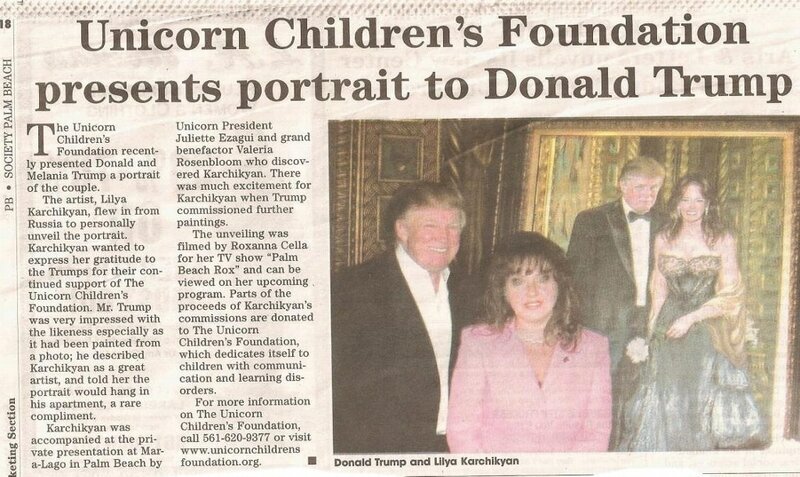 ​The Unicorn Children’s Foundation recently presented to Donald and Melania Trump a superb portrait of the couple. The artist Lilya Karchikyan flew in from Russia to personally unveil the portrait. Lilya wanted to express her gratitude to the Trumps for their continued support of The Unicorn Children’s Foundation. Mr. Trump was very impressed with the likeness especially as it had been painted from a photo; he described Lilya as a great artist, and told her the portrait would hang in his apartment, a rare compliment. Lilya was accompanied at the private presentation at Mar-a-lago Palm Beach by Unicorn president Juliette Ezagui and grand benefactor Valeria Rosenbloom who discovered Lilya. There was much excitement for Lilya when Mr. Trump commissioned further paintings. The unveiling was filmed by Roxanna Cella for her TV show Palm Beach Rox and can be viewed on her upcoming program. Parts of the proceeds of Lilya’s commissions are generously donated to The Unicorn Children’s Foundation, which dedicates itself to children with communication and learning disorders.